Edit Sandor Kleinbarth was born in Budapest in 1931. Her parents were Sandor and Elise Kleinbarth. Her father came from a “private” Hungarian family. He had learned the art of school riding in the Czech Circus Henry. Also, he developed and presented animal revues with monkeys, ponies and donkeys. Her mother, however, came from the old circus family Althoff. Until 1939, Edit Sandor Kleinbarth’s parents had had engagements in various European variety shows and circuses. 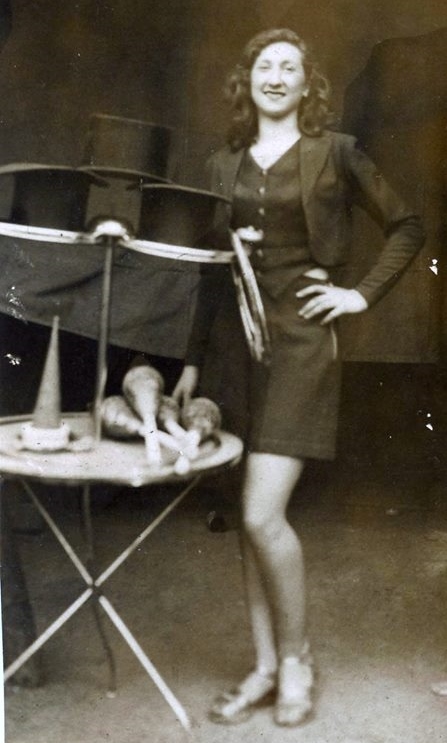 From spring 1939 until the end of the war in 1945, they were engaged at the German Circus Helene Hoppe. Oskar Hoppe, the husband of Helene Hoppe, was considered “politically unreliable” by the National Socialist rulers. Therefore, Helene Hoppe, who had been born into the Althoff family and was a relative of Edit Sandor Kleinbarth, led the company “officially”. While Oskar and Helene Hoppe knew about Sandor Kleinbarth’s Jewish family background, his daughter, Edit, was not aware of it. She found out about this part of the family history only after the war. Despite the war, the family felt safe travelling with Circus Helene Hoppe. In her memoirs, Edit Sandor Kleinbarth described the cosmopolitan milieu of the Circus Helene Hoppe during the war. She remembered artists, workers and musicians coming from Germany, Italy, Japan, Austria, then Czechoslovakia and Hungary. The Circus also travelled to perform abroad during the war. According to Edit Sandor Kleinbarth, the circus was thriving during wartime, with no shortage of food for the animals. In the spring of 1944, at the age of 13, Edit Sandor Kleinbarth received her first employment contract. The end of the war came for her and her parents during a tour of the Circus Hoppe in Luxembourg in September 1944, when American troops arrived in the country. Already in July 1945, the Circus Helene Hoppe performed as a German Circus in front of American soldiers in France. In autumn 1945, Edit Sandor Kleinbarth and her parents left the Circus Helene Hoppe. After various engagements, among others in North Africa, the parents of Edit Sandor Kleinbarth decided to accept an offer from Finland in 1955. Their decision was based on their positive experiences from former Scandinavian engagements. However, the traditional security strategies of the circus people, such as hiding in the circus wagon – animal keeper Ernst Späth had no identity papers – and the circus language as a secret means of communication, were not forgotten. For Edit Sandor Kleinbarth, Finland became her home. Edit Sandor Kleinbarth: Balleriina hevosen selässä. Vaajakoski 2008.